Hector was born and raised in Chicago and after graduating from college, worked as a commercial claims adjuster and outside investigator adjusting general liability, auto, homeowner and workers’ compensation claims. 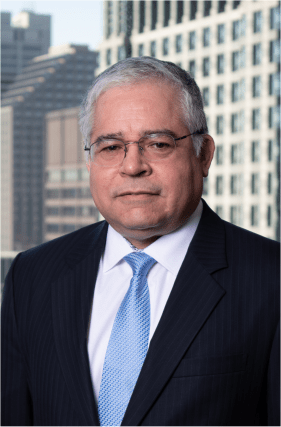 Upon graduation from law school, Hector worked as an insurance defense attorney in Chicago for various insurers and self-insureds concentrating his practice in the areas of construction, product liability, auto and premises liability litigation. In 2014, Hector moved to Arizona where he opened a restaurant and obtained his Arizona law license and licenses to produce auto, home, life and health policies. In 2018, he returned to Chicago and resumed his career as an insurance defense lawyer. Over his 24-year legal career Hector has worked closely with the insurance industry. Since joining Patton & Ryan, Hector has defended transportation, medical malpractice and premises liability cases. In his spare time, Hector enjoys playing golf.